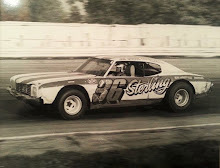 1994 - Jim Brown of Fremont, Iowa scored an emotional win in the 15-lap IMCA stock car feature at Bloomfield (Iowa) Speedway on Friday, July 15. Brown started on the outside of the front row, took the lead heading into turn one and then stayed up front the remainder of the way. 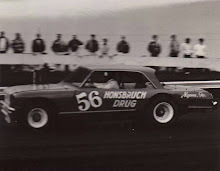 Brown drove the #54 stock car, the car that was built for his son Aaron to drive that season. However, Aaron was killed in a auto accident in March, so Brown, along with member's of his late son's pit crew, completed the car and Jim had been driving it this season. In another ironic twist to the finish, Mike McClure of Eldon, Iowa finished second driving the car that Aaron Brown drove during the 1993 season. 1988 - R.M. 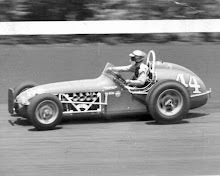 Van Pay of Green Bay took the lead at the start, then held off race-long threats by Merv Chandler of Cedar Rapids, Iowa and J.L. Cooper of Claycomb, Mo., to win the rain-delayed IMCA Modified National Series race on Saturday afternoon, July 16, at Luxemburg (Wis.) Speedway. The event began Friday night and with the modified feature lined up and ready to go, it began to rain and the race was rescheduled for Saturday afternoon. With the track rough from the previous night's rain, Van Pay held on for the $500 victory with Cooper right behind at the finish. Chandler grabbed third, Earl Muilenburg of Sparta, Mo., up from the 17th position, took fourth and Danny Wallace of Des Moines, Iowa, up from the 16th starting spot, rounded out the top five. 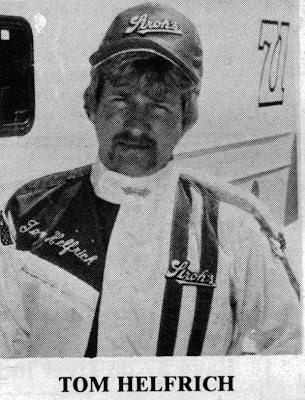 1983 - With his pre-race strategy working to perfection, Tom Helfrich scored the richest victory of his 15-year career in the 100-lap late model feature, capping the three-day National Dirt Racing Association (NDRA) Stroh's Dodge Nationals on Saturday, July 16, at I-70 Speedway in Odessa, Mo. Starting eighth in a 24-car field, Helfrich ran steady in the early going and restarted fourth following a mandatory fuel stop on lap 51. Helfrich stayed patient, then watched as Larry Moore, Freddy Smith and Rodney Combs all dropped out while leading the event. Helfrich inherited the lead on lap 74 and then held off Kevin Gundaker and then Johnny Johnson to collect the $20,000 payday. "Fuel and tires was the key" said Helfrich in victory lane." 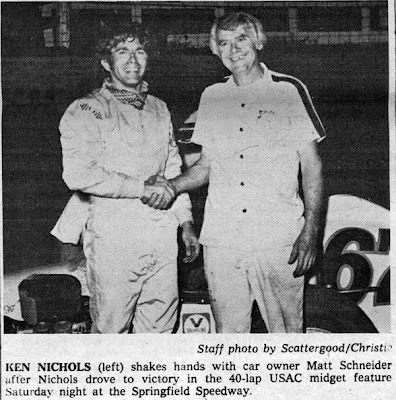 I knew it would be a race of attrition, so I just wanted to be near the front at the end,"
1977 - Watching the top-10 drivers in points drop like flies, Ken Nichols scored an upset win in the USAC Midget National 40-lapper at Lil' Springfield Speedway on July 16. 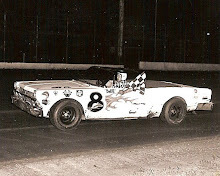 Nichols passed Ron Shuman on lap 23 and then held off both Larry Rice and Jerry Nuckles to secure the victory. 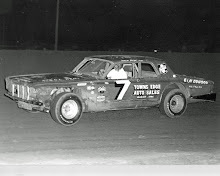 Mel Kenyon, Sleepy Tripp, Duke DeRosa and Bob Wente all saw their night's end due to mechanical issues or on-track accidents. Kenyon, the point's leader, won the trophy dash and first heat but got involved in a tangle early and finished 15th. Tripp, the defending champion, was also involved in a melee and was credited with 18th.